While we love and appreciate all of our horses, there are always some that seem to attach themselves deeper into our hearts. Some are true "hooves on" ambassadors who have carried countless riders for their first joyful rounds of tï¿½lt; others have just been done everything go anywhere horses or are just characters with unforgettable horse personalities. The following horses are a few of those amazing horses that remind us why we fell in love with this breed in the first place. If there was ever an election to find an official ambassador for the Icelandic horse, Sleipnir would surely be in the running for the title and he would get our vote. Born in 1989 in Iceland, Sleipnir’s career in Canada has been one of consistent gaits, sound mind, and unwavering character, in a blue dun kind of way. 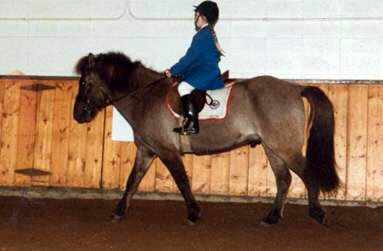 Chosen by Robyn to be 7 year old Mandy’s next mount, Sleipnir was one of many memorable horses imported in a 1989 shipment, which included Fraendi, Lettir, Djarfur, Valur, and Spori. 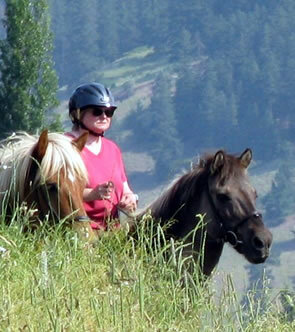 When Sleipnir arrived in Edmonton he and Mandy instantly clicked, enjoying many trail rides that taught her the ins and outs of a naturally tölting 4 gaiter and spoiled her thoroughly. 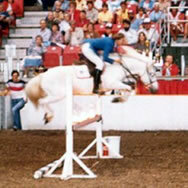 During his first summer in Canada, he and Mandy participated in a large gaited horse show. Entering many classes and consistently placing in the ribbons resulted in the pair of 7 year olds winning High Point Champion Icelandic against the likes of Robyn, Christine, and Phil. 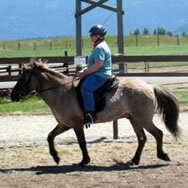 Then in September they made the trip to Calgary and participated in the Hood Family reunion ride at Spruce Meadows. The "Riding Hoods" ranged from 8 year old Mandy to her 80 year old grandfather, Hoodie. 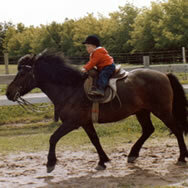 From then on Mandy and Sleipnir were inseparable, enjoying horse shows and trail rides equally. 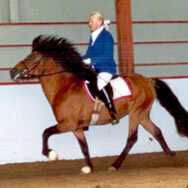 In 1992 the pair went along to a gaited horse show in Washington State, when Sleipnir’s showing days would effectively end. The horses were asked to change from a fast tölt to a canter and Mandy leaned forward asking for the next gait. At the same moment someone opened a glass door right beside the arena and Sleipnir caught his reflection and stopped, resulting Mandy taking a tumble during a class. 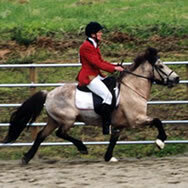 She was not hurt, but Sleipnir was so upset by the incident, he make up his mind never to enter another arena. 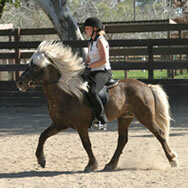 From the fall until almost a decade later, Sleipnir would not go forward in an arena. He would simply walk in, and then stop, not going forward with any sort of coaxing or coercing. He was NOT going to let another accident like that happen again on his watch. 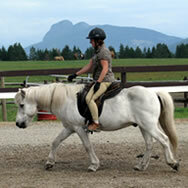 As the years went on Sleipnir’s roll transformed. 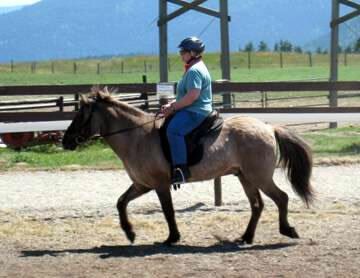 His steady temperament, easy, clean tölt, and solidly built frame made him a perfect horse for anyone from beginners to more confident riders, who were interested in riding the tölt, in lessons, and out on the trail. He knows his job and is happy to do it. However, going out alone or being pushed unfairly is not in his contract and he won’t do it. Ask nicely and you get all he’s got. 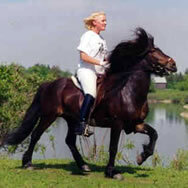 Sleipnir’s distinct character and bond with Mandy lead to his life being immortalized into a semi-fictional tale by Christine’s "Sleipnir’s Story", about his life from birth to the present. 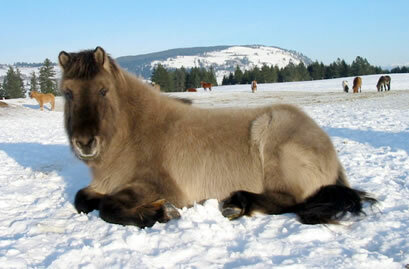 Sleipnir left us at the age of 36. He spent his last few years as resident yard horse, bringing joy to everyone who were lucky enough to meet him . During his three decades with the farm he has introduced, literally, hundreds of people to the breed, making him a true ambassador. 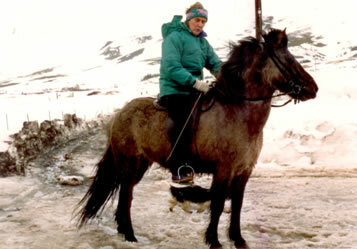 In his later year he was Mandy’s son’s special companion and mount. We we always remember him.